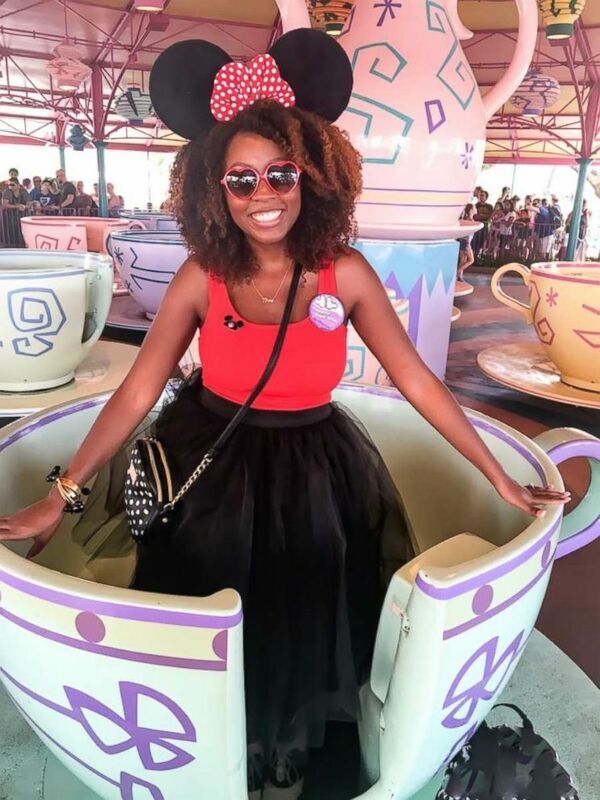 Last week, "Good Morning America" surprised Disney super fan Patrice Jenkins with the trip of a lifetime to celebrate 90 years of Mickey Mouse: A four-country tour to visit all six Disney resorts in just seven days. The destination each day was a surprise, and "GMA" shared the best moments from each day's trip, counting down to Mickey's birthday on Nov. 18. 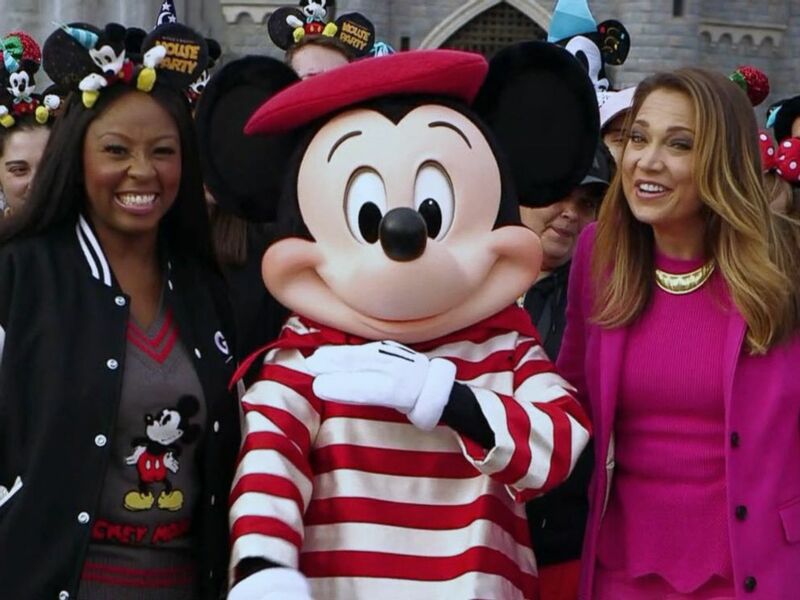 Today, Jenkins and ABC News' Ginger Zee have officially made it to every Disney park in the world in celebration of Mickey's 90th birthday, after making their final stop back in the U.S.A. at Walt Disney World in Orlando, Florida. At Walt Disney World, Jenkins received another surprise. She is ending her four-country tour of all six Disney resorts with a three-day cruise to the Bahamas and Disney's private island, Castaway Cay. 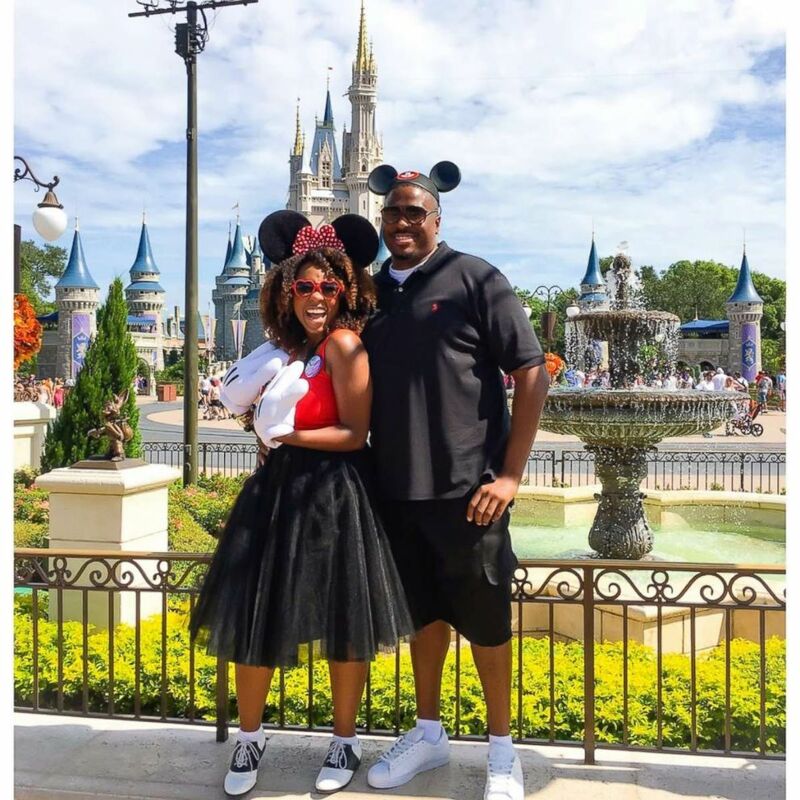 Jenkins' husband, D'Juan, surprised her at Disney World with their luggage packed for the cruise. "We were actually planning on going on [a Disney cruise] so this is amazing," D'Juan said. "Oh my gosh, this is amazing," said Jenkins. "Thank you so much." Just before the surprise, Jenkins and Zee were met at Walt Disney World with a very special announcement from Bob Chapek, the chairman of Parks, Experiences and Consumer Products at Disney, regarding the "Share Your Ears" campaign in honor of Mickey's birthday. For each photo posted on social media of someone wearing Mickey ears with the hashtag #ShareYourEars, Disney pledged to donate $5 to Make-A-Wish -- for up to $2 million. The response to the campaign has been phenomenal, people from all 50 states and all over the world have participated and the $2 million goal has already been met. In celebration of Mickey's birthday on Nov. 18, Chapek announced on "GMA" Friday that Disney is unlocking up to an additional $1 million for Make-A-Wish, so fans can keep the #ShareYourEars photos coming. Jenkins and ABC News' Ginger Zee welcomed the day in Shanghai on the balcony of Enchanted Storybook Castle at Shanghai Disneyland. 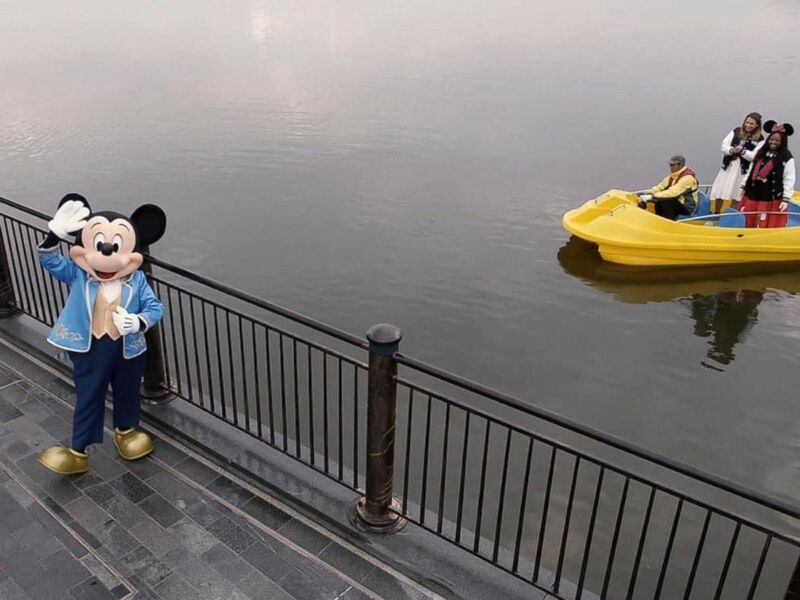 The duo then joined Mickey Mouse to warm up for the day with a session with a tai chi master. 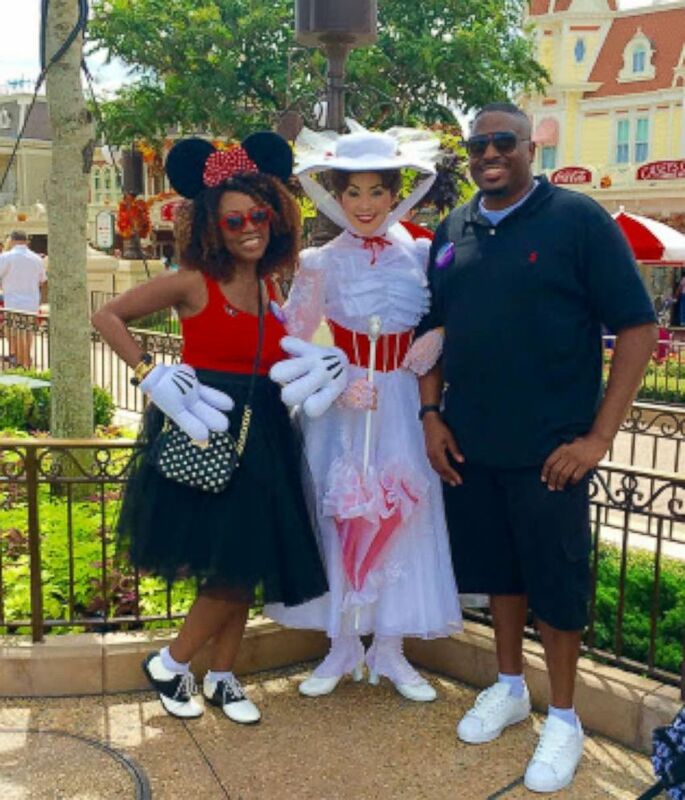 ABC News' Ginger Zee and Disney super fan Patrice Jenkins visit Shanghai Disneyland. Up next, it was on to the Walt Disney Grand Theater, home of the Mandarin production of Broadway's "Beauty and the Beast," where Jenkins joined the cast for the dress rehearsal. In Tokyo, Jenkins and Zee visited the first-ever international Disney resort: Tokyo Disneyland and its neighboring park, Tokyo DisneySea. Japan's Disney parks attract more than 30 million guests per year, and boast over 21,000 cast members and 77 attractions. Some of them that you won't find anywhere else include the Journey to the Center of the Earth, Pooh's Honey Hunt and 20,000 Leagues Under the Sea. At DisneySea, a park unique to Tokyo, Zee and Jenkins explore the seven themed ports, including the Arabian Coast, the Mediterranean Harbor and the American Waterfront, among others. ABC News' Ginger Zee and Disney super fan Patrice Jenkins visit Tokyo Disneyland and its neighboring park, Tokyo DisneySea. The duo tried out some of the park's famous popcorn -- something "so popular here the lines can stretch city blocks," according to Zee, and featured a rotating list of 25 different popcorn flavors. Today there are 10 of those flavors for sale including strawberry, garlic shrimp, soy sauce and butter. For their third stop, Jenkins and ABC News' Ginger Zee flew overnight from Paris to Hong Kong to hit up the Hong Kong Disneyland. The catch is that they had less than two hours to explore the whole park before it closed. Their strategy: Divide and conquer. While Jenkins hit up the Grizzly Gulch and met up with some of Hong Kong Dinseyland's original characters, Cookie and Duffy, Zee checked out the Iron Man Experience and the We Love Mickey! celebration. Finally, the duo reunited at Mystic Manor and then checked out the park's famous Paint the Night parade. 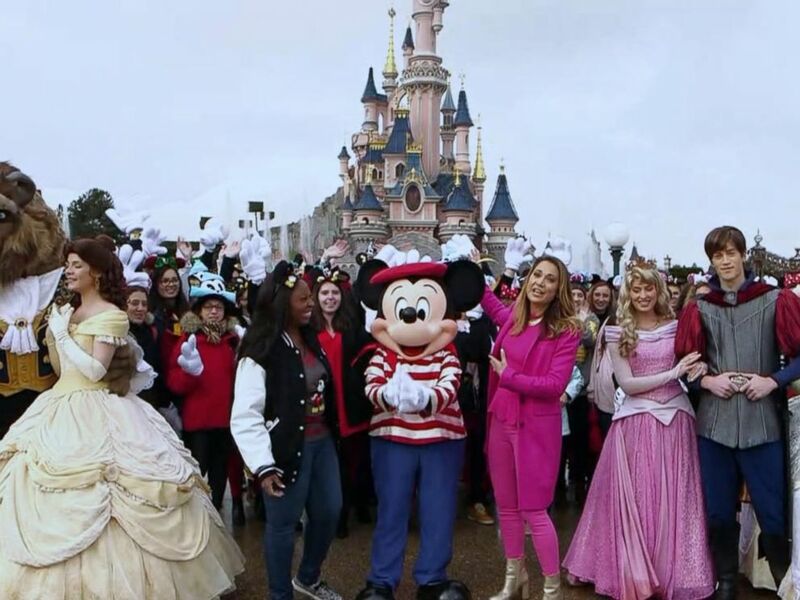 On Monday, Jenkins and ABC News' Ginger Zee are at Disneyland Paris, after making a stop at California's Disneyland -- Walt Disney's very first theme park -- on Saturday. Disneyland Paris is Disney's only resort in Europe and boasts two separate Disney parks and 59 attractions, all just 35 minutes from the Eiffel Tower. In Paris, Jenkins and Zee explored Sleeping Beauty's castle, which was inspired by both the fairy tale and a real French castle: Mont Saint Michel. 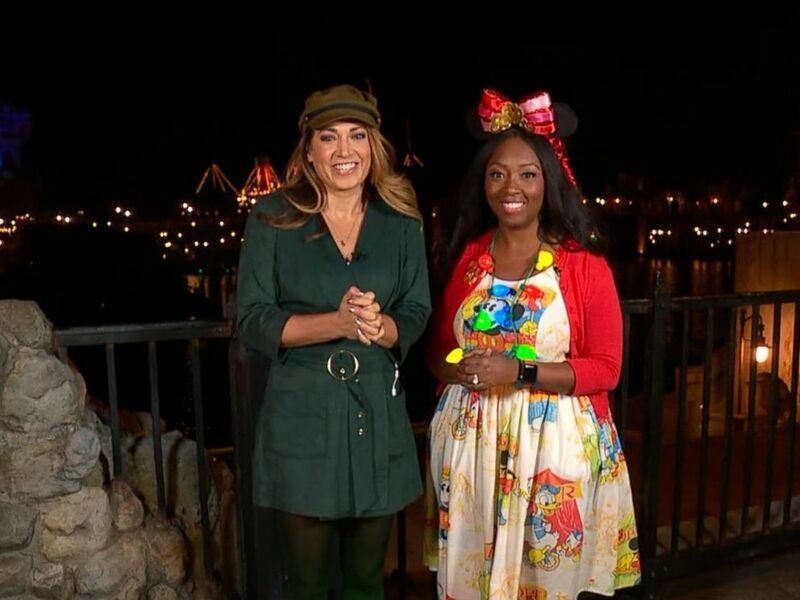 ABC News' Ginger Zee and Disney super fan, Patrice Jenkins, a teacher from Hinsdale, Illinois, visit Disneyland Paris. The duo also checked out the famous Ratatouille ride, where families shrink down to the size of a mouse, and the park's Star Wars Hyperspace Mountain, which is the fastest of all the Space Mountains. At the original Disneyland in Anaheim, California, Jenkins rode the park's latest attraction: the Incredicoaster. It's the park's fastest ride, and it was Jenkins' first time on an upside-down roller coaster. To celebrate 90 years of Mickey Mouse, "GMA" is taking a trip of a lifetime: A worldwide tour across four countries to visit all six Disney resorts in just seven days. Ginger Zee surprised Jenkins, a Disney super fan and teacher from Hinsdale, Illinois, in her classroom with the news that she'd be joining Zee on the around-the-world adventure, flying 23,464 miles across three continents to a new destination every day. Ginger Zee surprised Disney super fan Patrice Jenkins, a teacher, in her classroom in Hinsdale, Ill.
Their destination each day will be a surprise, and "GMA" will share the best moments from each day's trip today through Friday, counting down to Mickey's birthday on Nov. 18. Jenkins said she's the "biggest Disney superfan because I love Mickey." "To me, Disney means magic," the schoolteacher said. "When I think of Disney, I think about dreams coming true and imagining a world that is a faraway place where there's no pain, no suffering and you can be somebody else." MORE: New birthday cake-flavored Oreos celebrate Mickey Mouse's 90th birthday! Jenkins told "GMA" that "when I was younger, I didn't have a chance to go to Disney World." "At the time, my parents couldn't afford it," she added. "But my parents did their best to bring Disney into our home" including buying a Disney record player with "all the records of all the songs." Patrice Jenkins, a Disney super-fan, and her husband are photographed here. Jenkins said that she and her husband got married at Disney World. "We had a Mickey cake. On our cake -- it was three layers -- Mickey was all over it in gold," she recalled. "Mickey was at our wedding to give us the first dance, to talk to guests." As a teacher, Jenkins said "it's important to incorporate Disney themes because students have the opportunity to dream. I think in today's time, it's important to groom our students to become innovative thinkers." Emilio Villeda, one of Jenkins' students, said the lessons "teach us to be positive and inspires us to do better." Fellow student Mimi Mondragon added that "it makes it fun." "My friends tell me I'm so lucky," Mimi added. "They say, 'Oh, I wish I had her as a teacher. 'Cause they want somebody that's actually fun, you know?" 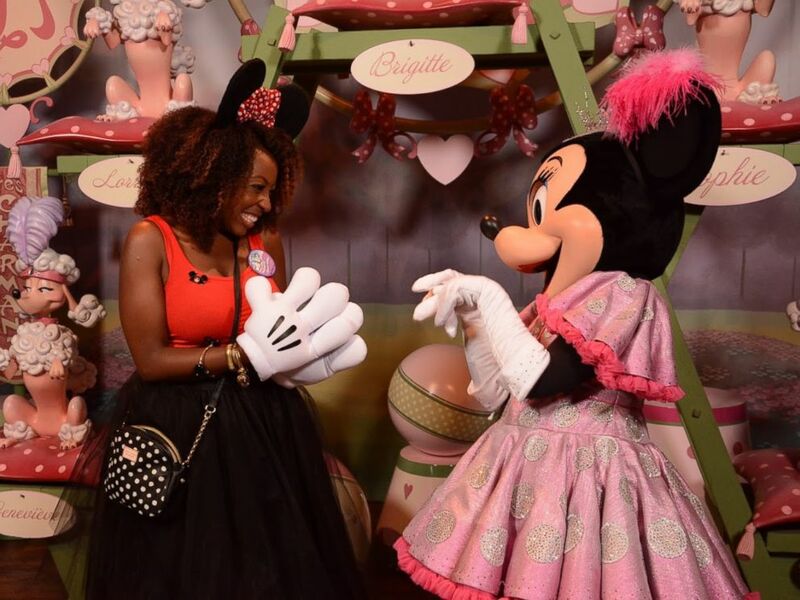 Schoolteacher Patrice Jenkins was surprised by "GMA" with a trip to visit various Disney parks around the world. As a Disney superfan, Jenkins admitted she even has Mickey Mouse ears "for every occasion." As part of the celebration of Mickey's birthday, Disney is partnering with Make-A-Wish to unlock donations by having people share pictures showing themselves in their Mickey Mouse ears on Instagram, Facebook and Twitter using the hashtag #ShareYourEars. For every post using the hashtag, Disney will donate $5 -- up to a maximum of $2 million -- to Make-A-Wish. The Walt Disney Co. is the parent company of ABC News.